12 Items Found. 1 - 10 of 12 Items Displayed. 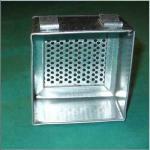 Box Feeder - 3 x 3 x 2 inch perforated bottom - Ideal for travel carriers. 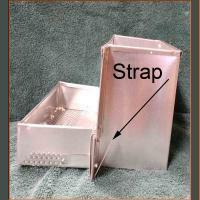 Rabbits won't chew these galvanized feeders! 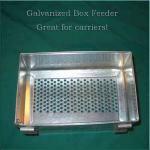 Box Feeder - 3 x 5 x 2 inch perforated bottom - Ideal for travel carriers. Rabbits won't chew these galvanized feeders! 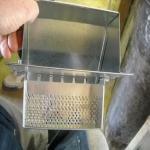 J- Feeder - 2 part - no need to cut cage These sturdy feeders have perforated galvanized steel bottoms that defy even the most aggressive feed diggers! One part mounts on the outside of the cage and the matching bowl piece mounts on the inside and is bolted together through the wire. No need to cut a hole in the cage. Feeds from the outside like a typical j-feeder. J- Feeder - 2 part - no need to cut cage - 3 inch wide - Strapped on style - These sturdy feeders have perforated galvanized steel bottoms that defy even the most aggressive feed diggers! One part mounts on the outside of the cage and the matching bowl piece mounts on the inside and is strapped together through the wire. No need to cut a hole in the cage. Feeds from the outside like a typical j-feeder. J- Feeder - 6 inch wide - 2 part - no need to cut cage These sturdy feeders have perforated galvanized steel bottoms that defy even the most aggressive feed diggers! One part mounts on the outside of the cage and the matching bowl piece mounts on the inside and is strapped together through the wire. No need to cut a hole in the cage. Feeds from the outside like a typical j-feeder.